As new in decorated boards. Expect something unexpected when a duckling lost at sea adopts a musical new friend in a whimsical, heart-lifting story from Timothy Basil Ering. Captain Alfred is sailing home with new ducks for his farm when his little boat is caught in an unexpected and mighty storm. Everything aboard the ship is flung to the far reaches of the sea, including the very special and beautiful duck egg he had nestled safely inside his fiddle case. But perhaps all is not lost: the little duckling stumbles out of his shell and discovers Captain Alfred’s fiddle, floating not too far away in the waves. And when the duckling embraces the instrument with all his heart, what happens next is pure magic. 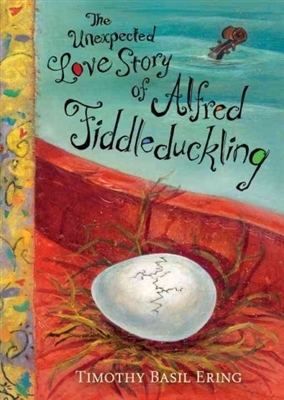 Through an enchanting read-aloud text and beautiful artwork, award-winning author-illustrator Timothy Basil Ering shares a thrilling and fantastical story of a farmer, a gentle old lady, a dancing dog, and one brave, tiny duckling that will warm the heart.